Even if you’re not lucky at the Vegas gaming tables, you’ll always have access to a million dollar view at Tod English’s Olives. This Mediterranean restaurant is located in the famous Bellagio Hotel & Casino and offers you amazing vistas of one of the top attractions of Las Vegas: the Bellagio fountains. Reserve your table after 9pm, when the worst heat is over, to be seated outside and have front row access to this jaw-dropping spectacle. 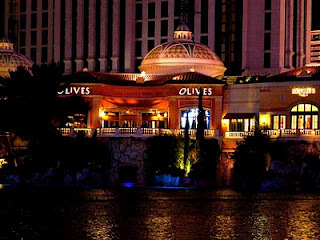 Unlike the flashy dining scene you usually find on the Strip, Olives falls into the slightly more classy category. The food is good, with a nice selection of affordable flatbreads and pastas, and wines to pair them with. 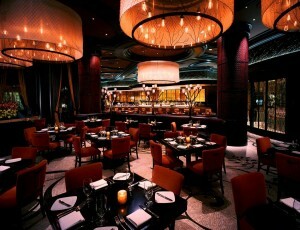 The waiters can be a little arrogant but the gorgeous views and entertainment will ensure a great night out. It’s extravagant, it’s fun; it’s Vegas at its best!